By admin | October 11, 2016. 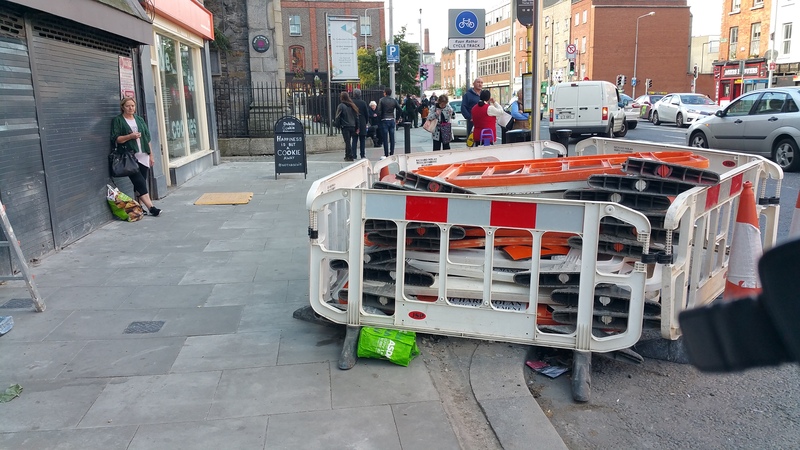 The footpaths on Thomas Street have been getting fixed up as part of the Business Area improvement Initiative, a scheme which has been in place for the last three years. The repaving programme started in 2014 and now the final section is being finished, from number 66 (Chadwick’s) to Catherine’s Lane West on the south (outbound) side of the street. The work was due to finish in mid-October. Along with the repaving, there are a number of structures being restored in the area. Dublin’s oldest house at 130 Thomas Street is getting a facelift. More visibly, the restoration of the iconic arch at Chadwick’s Builders Centre has just been completed. ACOL Ltd, the same company that undertook the work on the front of the Shelbourne Hotel, undertook the project of returning Chadwick’s arch to its former glory. The arch now stands as a unique monument which emphasises Thomas Street’s ongoing revival. The next phase of work to this project is to see new gates installed in the arch, along with a redesign of the adjoining shop-front. The project was funded by Dublin City Council’s Shopfront Improvement Scheme for the Liberties and the Built Heritage Investment Scheme. Chadwick’s is only one of the refurbishment projects taking place on Thomas Street at the moment. The Shopfront Improvement Scheme, which has been ongoing for the last year and a half, has motivated several business owners to renovate their properties and shopfronts. Arthur’s Public House, Dublin Cookie Co., Finestyle Furniture, La Catedral Studios and Reilly’s pharmacy are just some of the premises who’ve successfully taken part in the scheme. More premises are said to begin shopfront renovation in the second half of this year.